At an age when many of his classmates are thinking about who they want to ask to homecoming or the senior prom, Justin Cupit dreams about his peers dancing to his music at those functions. 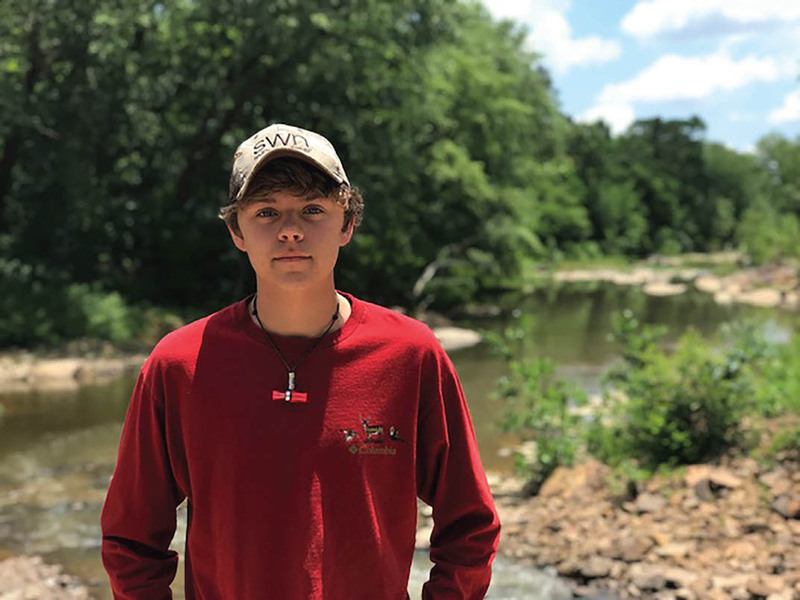 Cupit, a 17-year-old senior at Greenbrier High School, has been singing since middle school, and his combination of simple, down-home lyrics and catchy melodies has caught the attention of music producers from LA to Nashville. In December 2015, Cupit found himself in LA where his sister Brittni was recording a song of her own. Justin amused himself by singing and humming off to the side, which caught the ear of the producer who asked him to get behind the mic. He wound up recording a cover tune, and he was on his way. Seventeen-year-old Justin Cupit, a senior at Greenbrier High School, has been singing since middle school and is pursuing a music career. In the time since, Cupit has written and recorded a number of songs, signed on with a vocal coach and is working on a country music album. Cupit writes most of his own music, although he’s also very receptive to taking direction, such as when he was in Nashville recording his latest single, “Papa Drivin’ Home.” There, he worked with seasoned session musicians who were a big help refining the final product. “I do write most of mine, but it’s not just me. I do have a team effort,” he said. “My dad will help a lot, and we’ve had several other people help us write the music. Having a music video on YouTube and a single on iTunes is great, but it doesn’t totally insulate Cupit from the everyday pressures and problems of any other teenager, he said. Whether he’s up or down, Cupit looks to his family and his faith to keep him grounded and happy. “I’ve got the best parents I can honestly ask for,” he said. “They let me be who I want to be, but they don’t want me to go down the wrong path. When it comes down to being a parent and letting me do music, they’re going to watch out for what’s best for me and not let me do something that’s going to ruin my future. Cupit, a son of Chris and Roseann Cupit, is a multi-talented performer. Before getting into music, he landed several modeling and acting gigs. And, he’s as driven in the classroom as he is to make it in the entertainment business. This spring, he’ll graduate high school having simultaneously earned an associate’s degree from UA Little Rock. In the fall, he plans to attend the University of Central Arkansas to finish his bachelor’s degree in a discipline other than music, giving him a fallback if singing doesn’t pan out. But don’t look for him to hang up his mic anytime soon. He said between his parents’ support and help from people in the industry, such as recording artist Neal McCoy who’s helping him refine his next project, there’s a lot of music left in him. And wherever this road takes him, it’s been a journey that’s taught him an important life lesson.